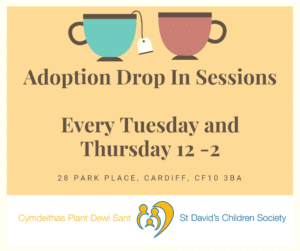 For some time now, St. David’s Children Society have hosted Adoption Drop In Sessions, every Tuesday and Thursday from 12-2 at our Cardiff office, for people who are thinking about adoption and have questions they would like to ask. We appreciate that for many people who initially contact us, adoption may have been something that they have been thinking about for a long time and that first contact may seem really daunting and to speak to a stranger over the phone about it may seem like a really odd thing to do! Our Drop In sessions are a really informal way for people to find out more, ask questions of an experienced member of staff and to find out about the next steps. 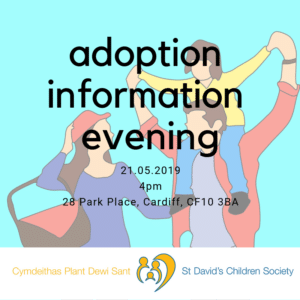 If after the session, you feel that adoption is not right for you, that is absolutely fine, but if you feel like the time is right for you, we can advise you of the next steps. Our goal is that you find out all the information that you need at whatever stage you are at, and you feel comfortable in talking to us. No appointment is needed, just come along between 12 and 2 on Tuesdays and Thursdays, and we will put the kettle on and hopefully answer any questions you have!